Plans Move Forward for Magnolia Development. Live 5 News. CHARLESTON, SC – Container volumes increased 14 percent during SC Ports Authority’s 2015 fiscal year, building upon several previous years of above-market growth with strength across all business segments. SCPA handled 1.9 million twenty-foot equivalent units (TEUs) during the fiscal year that ended June 30, a jump of 231,473 TEUs from the 2014 fiscal year. June volumes provided a strong finish to FY2015 with 169,913 TEUs moved during the month. Pier containers, or box volume, also climbed 14 percent in FY2015 with 138,221 more boxes handled compared to FY2014. SCPA moved 96,916 boxes in June, pushing total fiscal year volume to 1.1 million containers. Strong fundamentals played a key role in the above-market growth of SCPA’s containerized cargo segment. Amidst progress of the Panama Canal expansion and the Bayonne Bridge raising, big ships have transitioned to East Coast trade routes, and SCPA currently receives 11 post-Panamax vessel calls each week. Manufacturing in the Southeast remains strong, and SCPA provides the deep water required to handle ships fully-loaded with heavy exports. The booming automotive sector in the Southeast also supported both import and export volume gains. Successful recruitment of discretionary cargo played a key role in SCPA’s above-market growth as well. A competitive, broad-based rail market with ample capacity has made SCPA the port of choice for cargo produced beyond the Southeast region, including plastics from the US Gulf and agricultural products from the Midwest. Volume gains of agricultural exports were also driven by local industries such as SC-grown soybeans, whose export volume doubled during the last fiscal year. In the non-containerized cargo segment, breakbulk tonnage exceeded fiscal year planned volumes by 6 percent with 1.4 million pier tons handled during the year. Georgetown moved 548,933 tons during the period, while Charleston handled 871,974 tons. Roll-on/roll-off cargo within the breakbulk sector grew significantly, and SCPA achieved the highest finished vehicle volume ever handled at the Columbus Street Terminal. In FY2015, 253,338 vehicles moved across SCPA docks, an increase of 15 percent over the previous record of 219,900 vehicles in FY2008. Monthly volumes peaked at the Inland Port in June, with 6,736 rail moves handled during the month. The terminal’s first full fiscal year of operations concluded with 58,407 rail moves, which surpasses initial annual volumes projected five years into terminal operations. In the fiscal year ahead, SCPA expects to continue to grow above the US port market average and focus on increasing revenues to fund its capital projects, including the construction of the Navy Base container terminal by the end of the decade. FY2016 will also be a significant year for deepening the Charleston Harbor to 52 feet, with the Chief’s Report expected in September while the Preconstruction Engineering and Design phase is ongoing, followed by construction. Work begins in earnest this month on a long-delayed construction project on Upper King Street that will be anchored by two Hyatt hotel flags. Crews are preparing to demolish several vacant structures on 2.4 acres at King and Spring streets as the $80 million second half of the Midtown redevelopment project gets rolling. Preliminary test pilings are already underway. A 10-story dual-branded Hyatt House and Hyatt Place hotel with a combined 304 guest rooms and ground-floor retail space along King will begin taking shape on Aug. 26, said Reid Freeman, president of Atlanta-based Regent Partners, a partner in the long-planned project with CC&T Real Estate Services. It’s scheduled to be completed in March 2015, said Robert Clement, president of Charleston-based CC&T. The project will include four new buildings totaling 433,000 square feet. Two existing structures on the site will be saved. In addition to the 232,000-square-foot hotel, a seven-story parking garage with 400 spaces will rise on an adjacent parcel. Freeman said the group decided to go with a dual brand of Hyatt because it’s looking to capture different types of guests. The hotels will have separate lobbies. Hyatt Place will be the bigger of the two, with 191 rooms. Midtown, which originally included the parcel where the 200-unit Elan Midtown apartment complex is nearing completion, will be one of the largest redevelopment projects in downtown Charleston, Clement said. “For the longest time, King Street has needed this bookend,” he said. Evening Post Industries, The Post and Courier’s owner, also has plans for that rapidly changing area of the city. It owns about 12 acres at and around the newspaper’s headquarters, about a block north of the Midtown site. The company is proposing to redevelop the property into a mix of new residential and commercial uses, but no plans have been approved. One of the biggest changes calls for extending the city’s 50-room limit on new lodgings from Calhoun Street north to the Septima Clark Expressway. The proposed revisions also would eliminate hotel zoning in certain areas along Meeting and St. Philip streets to prevent intrusion into nearby residential areas. But an exception to the proposed limits has raised concerns from the preservation group that has pushed for the new restrictions. And some hoteliers worry about the impact of the updated regulations. The proposals won’t halt hotel development on the peninsula. The major projects that are either underway or previously approved aren’t affected. Those include the 304-room property scheduled to begin construction soon near King and Spring streets; a 185-room hotel planned for the site of the old Charleston County Library off King; a 165-room hotel coming to upper Meeting; and a 161-room hotel proposed for the former federal building across from Marion Square. All told, nearly 1,500 new rooms are in the works for peninsular Charleston, many of them smaller projects. “Anything speculative but hasn’t gotten a permit, this would stop that from happening,” said Tim Keane, the city’s director of Planning, Preservation and Sustainability. Mayor Joe Riley said he supports the changes. The city is proposing an exception to its expanded 50-room zone, which for now affects projects south of Calhoun Street. That provision would allow hotels with more than 50 rooms provided they have at least 20,000 square feet of meeting space and a full-service restaurant. Also, those properties would have to be within the area bound by Mary, King, Line and Meeting streets. Riley said that serves a useful purpose for visitors and residents because the bigger properties could handle wedding receptions and other civic gatherings that a smaller lodging could not accommodate. The city last updated its accommodations rules in 1997. A local organization drew attention to the surge in downtown hotel development in the spring by calling for new restrictions. The Preservation Society of Charleston said this spring it was concerned about overbuilding and the impact it would have on the peninsula. “We are being inundated with hotel proposals, and it’s not healthy for the historic district,” Robert Gurley, the group’s director of advocacy, said in April. The group is now hailing the proposed expansion of the 50-room cap and the city’s effort to prevent hotels from encroaching on residential neighborhoods. “We believe this will lessen the impact of traffic and encourage the diversity of uses,” Gurley said recently. At the same time, the Preservation Society is concerned about the provision that keeps the door open for bigger hotels in the expanded room-cap zone. “We believe this has the potential to diminish the impact of the 50-room cap,” Gurley said. Dan Blumenstock, the past president of the Charleston Area Hospitality Association, said he supports the exception to the 50-room limit, but he takes issue with imposing restrictions on hotel sizes with one broad stroke. “I get very cautious when any government is trying to impose a one-size-fits-all,” said Blumenstock, who is vice chairman of the Charleston Area Convention and Visitors Bureau and manages Fennell Holdings’ Lowcountry Hotels. “Maybe it should be done on a case-by-case basis. The more than 100-member hospitality association has not taken an official stance on the issue, because no one from the group has made a request, Blumenstock said. Unless someone does before City Council considers final approval next month, the organization won’t get involved, he added. Local real estate developer Robert Clement, who is part of a group that is about to break ground on a 304-room, 10-story dual-branded Hyatt hotel at King and Spring streets, said extending the 50-room limit while also allowing larger, full-service hotels strikes a good balance. Reach Warren L. Wise at 937-5524 or twitter.com/warrenlancewise. Article By: David Slade at 937-5552 or Twitter @DSladeNews. With resurgent development bringing new apartments, hotels and shops to the Charleston peninsula’s upper King and Meeting streets, one landowner is rolling out plans that could remake nearly three city blocks. Evening Post Publishing Co., the parent company of The Post and Courier, owns nearly 12 acres along King, Meeting and St. Philip streets. It’s an area nearly twice the size of Marion Square, and more than half the land is vacant or used for parking lots. In all, it’s one of the largest contiguous pieces of property south of the Crosstown. For city and neighborhood representatives who see vacant lots as eyesores, talk of redevelopment has been received with cautious optimism. “Something needs to go there because it’s a blighted area,” said City Councilman Robert Mitchell, referring to a large vacant lot at Meeting and Columbus streets. With large buildings rising just one block south, at Spring Street, Evening Post Publishing has laid out a concept plan that could extend the redevelopment of upper King and Meeting streets as far as Line Street near Interstate 26. City officials plan to work with Evening Post Publishing to hold public input and planning meetings, to consider the future of the property. Ron Owens, Evening Post Publishing’s vice president of finance, said the company could break ground in 18 months. “We hope to start talking to developers in the next few weeks,” Owens said. The immediate focus of what could be a 10-year redevelopment will be the vacant lot at Meeting and Columbus streets, across from a Piggly Wiggly, and an adjacent parking lot. “Of course, I don’t want any grocery stores over there,” he said. 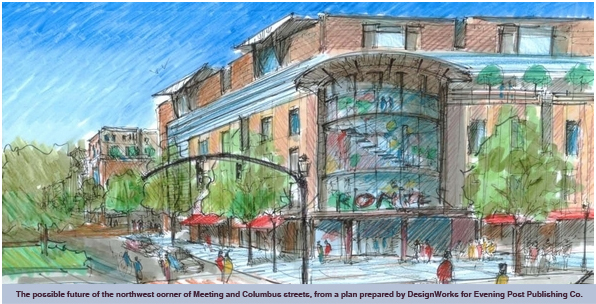 A master plan prepared by DesignWorks suggests the land at Meeting and Columbus should be primarily retail space, with a parking garage in the center of the property hidden by surrounding buildings. The site is immediately north of ongoing construction on Meeting Street that will result in a 200-unit apartment building at Spring Street, a 120-room Holiday Inn at Woolfe Street, and a 42-unit apartment complex at Reid Street. “It’s a great property, obviously, located right on the main entry into town, adjacent to neighborhoods,” said Tim Keane, director of Planning, Preservation and Sustainability for the city. Redevelopment would likely involve zoning changes, because the Evening Post Publishing land is mostly zoned industrial or “general business.” The city has been encouraging development that includes a mix of residential and commercial uses, unsuited to those zoning classifications. “Anything would upgrade the area, but we need to make sure it’s smart growth,” said Mitchell. He expects constituents will be interested in potential jobs, as well as new places to shop. “The biggest thing is jobs,” Mitchell said. The company has sought no plan reviews or zoning changes, but has discussed redevelopment concepts with city officials and some civic groups. In addition to new buildings, Evening Post Publishing’s plan looks at possibly extending Columbus Street by one block to St. Philip Street, preserving a freight rail right-of-way that the city hopes to use as a greenway or bike path, and creating some small parks. The idea of redeveloping the land comes as no surprise to those who keep an eye on downtown planning and development. The company previously commissioned a Clemson Architecture Center study. The Clemson study bluntly described the Evening Post Publishing properties as “an urban wasteland” dominated by an “unattractive” newspaper building, and called for building a new newspaper office building, hundreds of homes, and commercial and office space on the company land. The company’s new master plan anticipates 450 residences, more than 900,000 square feet of retail and office space, and three parking garages with more than 2,100 spaces. The fate of the newspaper operation is a question left undecided. The Evening Post Publishing building, built in 1952, runs the length of a King Street block and houses company and newspaper offices, printing presses and loading docks. The company plans to address that section of the property last, after redeveloping vacant land and parking areas. Parker said concepts for the land were developed with an eye on city planning documents such as the Century V Plan. “One of the things the mayor has said is that he would like to see more people living downtown, and our plan encourages that,” said Parker. Keane said the direction redevelopment will likely take seems pretty clear, with an extension of the business district between King and Meeting, and residential development on St. Philip Street. The large main parking lot for Evening Post Publishing extends from King Street to St. Philip Street, which is otherwise lined with homes. The company plans to work with developers, but expects to retain property ownership. “We want to continue to be the masters of the destiny of this property, but we don’t want to be the developers,” said John Barnwell, vice chairman and CEO of Evening Post Publishing. Board Chairman Pierre Manigault said Post and Courier readers will expect the paper’s editorial page to hold the company to the same standards as other developers.